Is this goodbye to British politics and goodbye to Britain? Jane Barlow/PA Wire/PA Images. All rights reserved.The age of perma-campaigning and elections continues in Scotland. Theresa May’s snap election, supposedly to give her a mandate for Brexit which she already had, will be Scotland’s seventh visit to the polls in the last three years. For some of us, a select few, this is nirvana. For many more it is an unwanted intrusion. But while mainstream media vox pops show us the now legendary Brenda from Bristol, who says how disgusted she is at having to vote again, a YouGov poll showed that 49% thought May was right to go the country and only 17% disagreed. The battlelines of the contest, both clear and unclear, are being drawn. This is an election which will be about more than Brexit and independence, but the multiple crises and uncertainties of the UK. It isn’t an accident that there have been a pile-up of elections and referendums in the UK recently, because this is one indication of the fading power and legitimacy of the political classes. 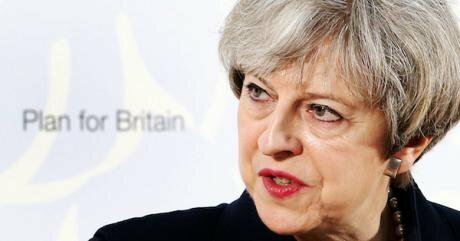 Theresa May wants the election to be about Brexit – the number one issue with voters (51%) according to Ipsos MORI. Jeremy Corbyn and Labour are clear that they want it to be about practically anything rather than Brexit; the issue that they most have a divided message on. The Lib Dems are clear that they gain from an election about Brexit, where they can position themselves as the one UK political party with a pro-European message. Finally, the SNP are determined to make it an election not explicitly about independence, while knowing that they are playing a longer game towards that end. What then will this election be about north and south of the border, in Scotland and the rest of the UK? For a start this will not be, no matter how effective May’s control freakery politics are, a UK election solely about Brexit. No election is ever a single-issue event. Numerous people have already cited Ted Heath’s February 1974 “who governs Britain?” campaign, when the voters answered: not Ted Heath and his Conservatives. Voters also have a tradition of turning on politicians who inflict unnecessary elections on them. Examples of this include Harold Wilson in 1970 when he had a massive majority of 97 and lost it, and Clement Attlee in 1951 going to the country in the October after winning an overall majority in February of the previous year. In Scotland, many mainstream sources are saying this will be an election about independence. Sarah Smith, BBC Scotland editor, has been repeating the line ad nauseam that this election will be “a referendum on a referendum.” But this isn’t straightforward, simple, or necessarily true. The ‘referendum on a referendum’ line is the direct Tory line of Ruth Davidson for whom it is a good campaigning trope. For the Tories this is a good attack point, playing to their troops, speaking for a significant part of Scotland, laying claim to the 55%, and a good gibe at the SNP. It works for them to an extent. However, taken to its logical conclusion this would mean that the Tory campaign was really saying that this was an election about Brexit and Scottish independence: a rather narrow constitutional menu for a UK election. It also exposes inconsistencies in the Tory view, with an election needed to offer clarity and a mandate (but not supposed division), but a second indyref refused because we need stability and to avoid division. The 2015 Scottish election was a watershed; the sort of contest which only comes along once in every couple of generations. Clearly, there will be no huge change from such a seismic change, which many observers equated to the impact of an electoral tsunami. The SNP enters this contest with many pluses. There is the strength of the SNP vote and its operation. The party will also more than any other party speak for the 62% majority of Scots who voted to remain in the EU, while the threat of an unwanted Brexit imposed on Scotland aids the Nationalists. Similarly, the rise of the Scottish Tories suits SNP strategists, positioning the party as the leader of anti-Tory Scotland. Related to this, the distinct likelihood of a Tory UK landslide with an overall majority of 140–150 seats. This heralds the return of ‘the Doomsday scenario’ big time – Scotland votes anti-Tory, but gets a Tory Government based on English votes. The SNP’s success though brings with it increased expectations and challenges. The party will be defending 56 out of 59 Scottish seats. Its chances of advancing from this are very slender, as are its chances of increasing its vote from the spectacular 49.97% it won in 2015. Any slippage, no matter how small, will be seized upon by opponents. There is the cross-class, national ‘Big Tent’ coalition that is the 2015 SNP vote. There were already signs in 2016 in parts of rural Scotland, that some of this was fraying at the edges. There are also the new faultlines and divides which emerged out of the EU referendum, with 36% of SNP voters supporting leave, making any SNP pro-EU message have to have a degree of flexibility about EEA/EFTA membership. And as if this weren’t enough, the party will next month have been ten years in office, has a record to defend, and also faces unease in places about any future indyref. Ten years of SNP success, winning elections and office, and having a sense of momentum behind them, has defined much. It has in some respects, slowly, but perceptibly, weakened the political antenna and sensitivities of the SNP and its supporters. Some of them now expect automatically political victory along the lines of ‘now we have 56 seats out of 59, what is to stop us winning the last Labour and Lib Dem, seats’, for example. The SNP have become the political establishment, while still in places having an outsider ethos. The party’s senior leadership more and more look, feel and act, no matter how good their intentions, like an insider class. This is what happens from ten years of incumbency. And in a few weeks the SNP will poll well in the local elections (as will the Tories), and will sweep Labour from most of their last remaining West of Scotland strongholds. All of this will produce increased expectations in supporters, and new attack lines for opponents. The Tory mini-revival that has been going on is discounted by many in the SNP and independence supporters, but it is real. In 2015 the SNP won 49.97% and the Tories 14.9%: their worst showing at a Westminster election since 1865. In the 2016 Scottish elections, the SNP won 46.5% and the Tories 22.1% of the constituency vote: which was a 3.5% swing from the SNP to Tories from the 2011 Scottish elections, and 5.2% swing from the previous year. The most recent poll on Westminster voting intentions from Panelbase has the SNP on 47% (-3), Tories 28% (+13), Labour 14% (-10), Lib Dems 4 (-4): changes from the 2015 contest, and representing a 8% swing from SNP to Tories. If the Tory vote rises to anything like this level of support then this is a significant reverse from the bottoming out, consistently under 20% at every Westminster election since 1997. It takes the Tories back to the support they won in 1983, 1987 and 1992, when Thatcher and Major won UK elections based on English votes. But importantly, with the exception of a tiny Tory rise in 1992, then the tide was running away from the Tories. Now they would be experiencing a significant, but small surge towards them. This shouldn’t be underestimated or overestimated, but after years of losing votes, the Tories feel the tide has turned, at least a bit. The SNP 56 are vulnerable at the margins. The eleven most marginal seats the SNP won have six gains from the Lib Dems and five from Labour. Thus, the party is vulnerable to any Lib Dem recovery where the party still has a presence. For example, the SNP might be under threat in Edinburgh West where Michelle Thomson was suspended shortly after being elected and the party is defending a 3,210 majority over the Lib Dems (5.9% of votes). Similarly, any Tory revival could see the party win in places such as Berwickshire, Roxburgh and Selkirk where the SNP are a mere 328 (0.6% of votes) ahead of the Tories. If the Tories revived substantially in parts of rural Scotland, a whole host of other seats could come into play. The bigger dynamic is that in 2015 the SNP at its peak came near to winning a popular majority. Any slip now in the party’s vote will be presented by the Tories – along with any seat gains – as some kind of vindication, even part of their national mandate. Thus, if the Tories, Labour and Lib Dems finish with more votes than the SNP, and even more a popular majority, the Tories will try to present this as some kind of virtual Better Together coalition. But that won’t wash very long and also risks drawing attention to the inconvenient fact that no matter how big Theresa May’s parliamentary vote is, she will have a mandate based on a minority of voters. How to mobilise, enthuse and reach out to voters will be a key factor in this election. There are already signs of voter fatigue. Will Theresa May’s call for a Brexit mandate reach out to parts of the 52%, former UKIP voters and disgruntled Labour voters? One former Labour voter thinking of voting Tory, Eric Wood from Barrow-in-Furness, said on the BBC that “Tories are the ones with brains…they are a pack of bastards…I don’t think people see the left as being smart”. This was the modern day voice of a very old tradition – working class, deferential Tories who think that the party of privilege has the class and traditions to govern better. Scotland’s indyref dividend is slowly weakening. In 2015 Scotland’s turnout of 71.0% was 4.8% ahead of the UK turnout of 66.2%. In the 2016 Scottish elections the 55.8% and 55.9% constituency and regional vote turnouts was a mere 5.3% and 5.5% up from 2011. And in last year’s EU referendum, Scottish turnout was 67.2% which was 5.0% below the UK 72.2% turnout. More important than these aggregate figures is who is turning out and who the voters are. The nature of this contest should play towards the SNP and the Tories in Scotland, and work to disadvantage an already disorientated Labour party. But the UK national contest will matter, if you look at differential turnout, and also generational divisions. UK Labour, for example, are faced with the huge problem not just of overall dire ratings, but the party having derisory support in the over-65s who come out to vote more. This is going to be a strange British and Scottish election. For one, British politics exists in name only and in the Palace of Westminster. There is obviously a British government, but there will be no pan-UK political contest. Scotland, Northern Ireland and Wales are in different political orbits from the rest of the UK, and there are several Englands. Theresa May has illustrated part of the weakness of Tory Britain and England, deciding to go the country as a partisan Conservative and in so doing, revealing the weaknesses and poor condition of unionism. Scotland and even more so Northern Ireland barely got a moment in her electoral calculations, such is the high regard held for the great union that is the United Kingdom. Instead, she has let obvious short term, tactical advantage override everything else. It seems unavoidable that she will win her own mandate and trounce the Labour Party, but at what wider cost? She has just handed Scotland and the SNP another opportunity to show that we are different and motivated by a different political dynamic. And while this election isn’t formally about independence in the way the SNP’s opponents say it is, everything political in Scotland is for now ultimately about independence. It is as much about democracy and mandates, but these all lead back to the independence question. No matter how certain Theresa May and Ruth Davidson may sound in their campaign speeches and on the stump, the Tories have just brought the endgame of the union as we know it and Scottish independence a little closer. No other outcome is really possible from this election.